When training dogs, if the owner or handler is serious about reaching success, they need to set out a lesson plan. Training doesn’t have to be difficult or time consuming, but there should be a commitment by the owner/handler to set aside a certain time to consistently train. How often is it necessary to train? “For steady progress, the dog and handler should work every other day, or three to four times a week,” states Lue Button in her book Practical Scent. “To maintain the skills already acquired takes two sessions a week. If the dog and handler can manage to work only once a week, they will probably slip back. Very few manage to keep their momentum over a seven-day gap, and the frustration accompanying failure at a task that may have gone well on first try will probably cause them to give up their training entirely after several weeks. Every month or so, a day-long field session in unfamiliar territory will help to maintain alertness and enthusiasm, as well as furnishing a good review. How long should a dog stay on each exercise or step in training? Unfortunately, there is no one answer that applies to all dogs. The early lessons … should be repeated three to six times or until essentially mastered (which will depend on the dog’s quickness at picking up new skills and the regularity with which the handler is able to train)…. Dogs remember best their first success at any new activity. If the first way they try to complete a task works, that is the way they will try to do the task each time they encounter it in the future. 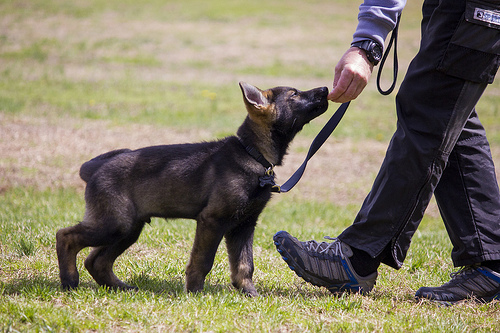 If they are taught another approach that the handler prefers, they may accept it after many repetitions, but if months or years later they have difficulty applying it, they will tend to revert to their original technique. That’s why it is vital to make the first try a success. As handler, you must prepare thoroughly. Read over the instructions; make sure exactly what you are going to do. Then do the thing right, and see to it that the dog succeeds. Praise or reward him thoroughly. And stick to that basic, successful technique. You can build on it, elaborate it, but don’t alter it. If you try method after method of doing the same thing, the dog will think that you don’t know what you want or else that you are trying to trick him and either way you lose his respect. This does not mean you will repeat and repeat the same exercise-to do so courts boredom of both dog and handler. A bored dog may refuse to work at all, do it “his own way” which may include rounding up all the squirrels and rabbits in the country, or do it in a lackadaisical manner that suggests he really doesn’t care whether he finds anyone. Bored people turn off their minds: they stop trying to read the dog, to observe the effects of wind and weather, or to understand the dog’s problems. Both partners must remain alert, keeping their minds on the task and on each other. This entry was posted in dog training and tagged dog training, how to succeed in dog training, success with dog training, successful dog training, training dogs. Bookmark the permalink. « So You Want to be a Breeder?